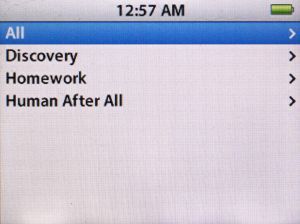 The iPod’s default behavior is to sort alphabetically. Discovery (2001), Homework (1997) and Human After All (2005). 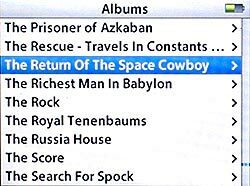 Not that long ago, I was asked by a commenter if I had any suggestions for getting the iPod to sort albums chronologically. By default, the iPod’s behavior is to sort albums alphabetically by title. In iTunes, there’s the option to sort “Album By Year” but the iPod features no such function. The most noticeable change in firmware 1.3 is the application of iTunes’ “smart sorting” (ignoring “a” “an” and “the”), including recognition of iTunes’ custom “Sort Fields” (Sort Album, Sort Composer), for Album and Composer. The Sort fields allow you to enter any text that you want and iTunes/iPod will use that to order the list of items, while displaying the text from the actual field. Using the Sort Album field, you can easily put albums in whatever order you like. For example, you could put the Halo number of Nine Inch Nails releases in the Sort Album field to have all items, including singles and remix albums, displayed in the order they were released. For basic chronological sorting, just put the year in the Sort Album field and voila, the iPod will show the album title, but they will be ordered by the year. UPDATE: The previous version of this post recommended putting the year of the album in the Sort Album field. This, however, effectively changes the name of the album within iTunes’ logic, making it group all albums of the same year together. The revised method is to simply prepend the year to the album name in the Sort Album field. This way, each album gets a unique identifier that still sorts by year. Additional caveat: this tip has the potential (there have been mixed reports) to reorder the listings of the “Album” browser, as the Sort Album field may be applied to it. So if you ever use the iPod’s Album View, keep this in mind. See the discussion in the comments for effects and solutions. As you can see in the image at top, the default behavior is to display the albums in alphabetical order, with Discovery as the first. How do we fix that? In iTunes, get info on the first song of the album. When you next update your iPod, the new data will take effect and the albums will be sorted by release date. 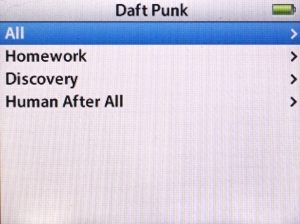 Daft Punk albums sorted chronologically. This process works for any 5G iPod that has been updated to firmware version 1.3 (and I assume iPods/iPhones released subsequently) So if you haven’t updated yours, hop to it and then get customizing. If you know the more specific album release date, you can prepend that to the album name. Example: If one album was released in March and another in October, use 2008-03 and 2008-10 . If you don’t know the date, you can order them with a number. Ex: 2008-1 , 2008-2 and so on. Lately I’ve been on a tear with audiobooks, managing to cram a number of books in between my regular music and podcast listening. The sudden upswing in interest has prompted me to renew my investigation of the problems the 5G (fifth generation) model iPod has with long-playing books. As I noted last summer, the 5G has troubles with homemade m4b files (bookmarkable AAC) longer than a certain play time. 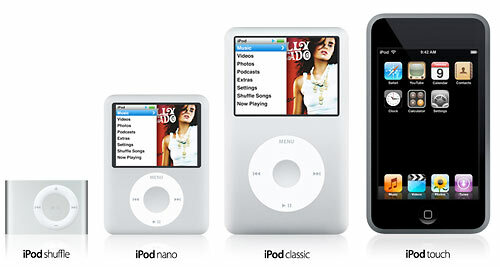 The iPod will suddenly stop playing an audiobook within a few minutes and return to the main menu. This happens when resuming a book, after having listened to something else or resyncing the device, basically anything that stops rather than pauses the book. 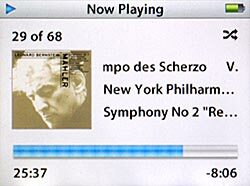 When selecting the book again, the iPod starts from the beginning, having lost the bookmark and updating the play count/date as though it had properly finished playing. Since I knew I would be delving into book territory, I decided to figure out the optimum way of working around the iPod’s inexplicable limitation. And really, for all my experimentation, the only concrete result I’ve been able to find is: 4 hours. 4 hours is about the maximum running time of any homemade m4b audiobook file before the iPod starts wigging out about it. It didn’t matter what I used for my encoding settings, my sample rates, or bit rates or channels or workflow or program. No combination of settings allowed the iPod to play longer than 4 hours without a hiccup, always stopping in the middle of the same phrase. I manually set the audiobook’s options in iTunes so that the start time was at the 4 hour mark, hoping to persuade my iPod to at least go for another 4 hours. No dice. I can say however that the sample rate seems to have the most effect on how long you can listen before the iPod won’t let you pick up where you left off. 22 kHz seems to be the trick. Whether your book is stereo or mono seems to matter little, giving about the same performance. Same for bitrate. However, higher sampling rates seems to reduce the amount of time before you lose the bookmark feature. There probably are a handful more combinations and techniques I could try, but it takes quite a while to join, encode, test and evaluate each option. If anyone finds something with significantly different results, feel free to drop a line this way. In the meantime, I’m glad Audiobook Builder can set a Maximum Part length and will split files so that nothing is longer than what I need them to be. It’s a groovy little workaround. Thinking of an iPod Shuffle? Find one on Amazon. Birthday season is in effect around the tunequest compound and themodernista kicked off the festivities by presenting me with my long-desired orange iPod Shuffle (2G) (which I have dubbed “Shuffleupagus”). I had been struck by the orange model since they were announced this past January, but despite its relative inexpensiveness, I could never justify purchasing one; I’m a fairly austere guy when it comes to material goods and all my iPod needs have been handled quite nicely by my 5G. Still, the gift is not unappreciated, though I am somewhat abashed to admit that it makes the seventh iPod in six years for a family of two. After palling around with the device for couple days, I’ve made some observations. 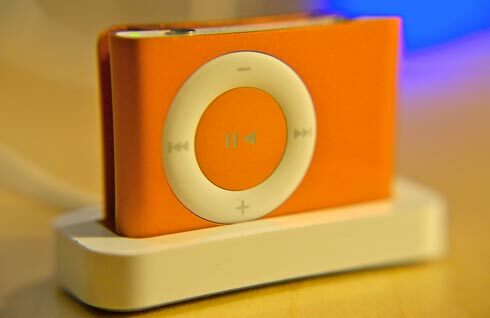 Overall, the iPod Shuffle is pretty sweet and the vibrant orange casing is quite the eye-catcher. Straightforward and easy to use, it provides no-thinking audio entertainment. I love my 5G-pod, but its daily use often involves effort, whether its assessing new music, adding star ratings, absorbing dense material such as audiobooks and podcasts or just plain searching for something I’m in the mood to hear. The Shuffle, with a suitable playlist, provides a worry-free, effortless and enjoyable experience and the one gigabyte capacity provides ample music for daily jaunts, commutes and errands. That experience, however, does come with some caveats. The iPod Shuffle’s biggest strength is also its biggest weakness: the lack of a screen. The same brain-dead simplicity that allows for simple recreation also can be a hindrance in some situations. On my 5G, whenever I run into a track that might be corrupted or otherwise malformed, I mark it with two stars as a way to pull it out of rotation and set it aside for reevaluation at a later date. On the Shuffle, that’s just not possible. And of course, when I can’t quite place the name/artist/album of the song I’m listening to, I’m just out of luck trying to identify it. Also, the unit provides no visual indicator for volume. It’s hard to know exactly how loud the Shuffle is set without any visual feedback. I had it plugged into the tape adapter in my car and nearly blew out the speakers when a quiet classical piece transitioned to some bombastic Primus bass. Gave me quite the jolt too. 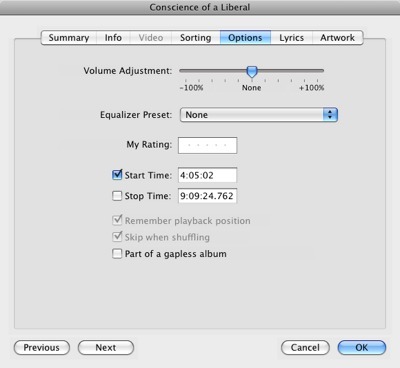 In iTunes, however, you can set a maximum volume with a volume limiting slider. Also, there’s no internal clock. The vast majority of my listening habits rely on the heavy use of iTunes’ Last Played Date. As a condition on my Smart Playlists, I use it to automatically refresh my listening selections, rotating recently played songs for those that haven’t been played in a while. The first-generation Shuffle was noted for its lack of a clock and, unfortunately, its successor is no different. 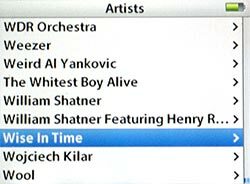 Without a clock, the Shuffle has no way to know when you’ve finished playing a song and thus can’t update iTunes the next time you sync up. 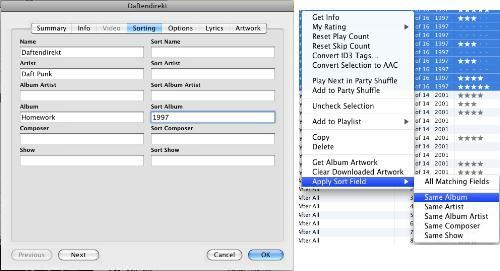 Instead, iTunes sets the Last Played Date to the time at which you perform the sync. While not quite as precise as I’d prefer, I tend to update my Pods frequently enough that it shouldn’t disrupt my schemes significantly. Then there’s the size again. The thing is wicked small and keeping track of its whereabouts has proven bit elusive. A couple times already, I thought I had misplaced it or lost it under some paperwork when it was actually still clipped to my pocket. That’s definitely a behavioral change that I’ll have to adjust to. Despite these minor inconveniences, and that’s really what they are, inconveniences, the iPod Shuffle is a solid product. In the few days I’ve had it, I’ve already found myself reaching for it more often than my 5G when I want to sit back and relax. In fact, once I get going, I find myself hesitant to turn it off. The only thing I need to figure out now is how to shuffle-by-album (if that’s even possible) rather than default shuffle-by-song. …and managed to sully my iPod too. And the more I think about it, the more pissed off I get. What Apple has done defies all standard convention, is completely arbitrary and makes ab-so-lute-ly zero sense whatsoever. Allow me to go on. I had put off updating my iTunes to 7.3.2 until a couple days ago. With all the time and energy I invest into pruning and perfecting my library (it’s like bonsai really), I usually give the early adopters in the Mac community enough time to warn me of any critical errors or whether the new update is going to irreparably damage or otherwise soil my files. It’s just common sense. So, having read no reports of exploding iPods or iTunes-induced electrocutions, I figured it was time for the latest and greatest. At the very least, I could get the app to stop bugging me about the update every time I launched it. The update process went smoothly enough, like a Dove chocolate bar, and I was quickly back to makin’ playlists and retrieving album art. It took me about a day, however, to realize something was… awry. The default view of the Music tab had changed. As a matter of course, I keep it set to Album by Year, which in effect sorts by artist then sub-sorts the albums by the year they were released. Before the latest update, that meant that the band !!! was listed first, followed by +/- then into the numbers. It was logical: standard convention dictates that that’s the way alphanumerical sorting is done in English. On one hand though, I do have to give iTunes some credit. When sorting numbers, the program is smart enough to know that, numerically, 101 Strings comes after 50 Cent. I’m not averse to change in general, and though somewhat inconvenient, these new sorting behaviors aren’t a fundamental flaw. I can deal with it. Update 8/28: I take that back. This IS a fundamental flaw and it needs to be fixed. There’s no excusing it. However, the real travesty here is how iTunes now treats the Composer tag. In this case, it looks like Apple specifically set out to destroy my Composer tag scheme, the one where cover songs have the original artist surrounded by [brackets]. 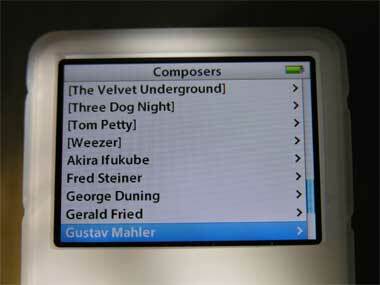 The purpose of that is to separate cover tunes from actual composers when browsing Composers on the iPod. Well, guess what? 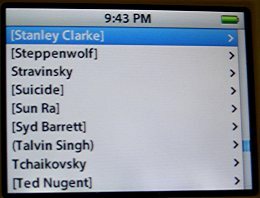 iTunes now ignores the non-alphabetic leading characters and sorts based on the first letter or number it finds in the name. And guess what else? The program now treats fields that are all punctuation as if they are blank, as if they don’t have any characters at all. It passes that behavior to the iPod. Now when browsing by Composers, the list I’m presented with is a jumbled mess. I’ve got [Fleetwood Mac] sittin’ next to Edvard Greig and [Ted Nugent] holding hands with Tchaikovsky, which is the exact situation I was trying to avoid in the first place! And that’s not even mentioning my workaround for remix albums, where I list the song’s originator in (parentheses). So, thanks Apple for fixing something that wasn’t broken. My carpool ended a couple weeks ago, as my riding buddy resigned to take another job. I’m going to miss the amity, conversation and, of course, the gas and mileage savings, but my solo commute will now give me the opportunity to invest more time into audiobooks and other spoken audio, passing the dreadful Atlanta Interstates somewhat more productively. I’ve started with Foucault’s Pendulum by Umberto Eco. It’s a fascinating adventure story about literature, philosophy, old secrets and the legacy of the Knights Templar told with compelling intellectual prose. I first read the book eleven years ago when I was in high school and it inspired my to write a paper on the Templars, which brought me into contact with a strange world of the paranoid and the occult. Since then, I’ve noticed in modern books and movies, how mythical versions of the Templars, like Atlantis, are often brought up as keepers of ancient secrets, power and wealth that even today’s advanced civilization can’t understand. Plus, a good portion of the book takes place in Paris, where I happened to be at the time I was reading it. At one point, I finished a paragraph and decided to immediately visit the location that had been described. That was pretty cool. However, unbeknownst to me at the time, between the publishing of the book in 1988 and my visit in 1996, the actual Foucault’s Pendulum was moved from the Conservatoire National des Arts et Métiers to the Panthéon, so I never did get to see it. That’s great and all, but what does it have to do with the iPod? Well, having decided to re-read/listen to the book, I promptly stitched together the nineteen audio parts into a bookmarkable AAC (m4b), which iTunes and the iPod treat as an audiobook. I started listening to it on the ride to work, getting about 30 minutes into the story. Once at the office, I switched to music, then when the day was over, switched back to the book for the ride home. As expected, the book picked up where it had left off, continuing the story. All was well for about a minute, then the book suddenly stopped, returning to the iPod’s main menu. When I restarted the book, it began playing from the beginning, having lost the bookmark. Annoying to say the least. I noticed the next I synced up that the file’s play count had increased by one, as though the iPod thought it had played to the end. This was not the first time this had happened; I had previously encountered this problem with a bookmarkable AAC audiobook of Al Gore’s The Assault on Reason, but at the time, I chalked it up to an error in the file. But this second occurrence indicated that something else might have been afoot. The behavior occurs anytime a homemade M4B file is interrupted, whether by playing another song/podcast/audiobook/video, syncing the iPod with iTunes, or if the iPod is asleep for long enough that it turns itself off and requires a reboot. The problem doesn’t occur if the audiobook is simply paused and restarted. So I set about trying to find a solution to this irksome problem. A quick trip to Google turned up a thread on the forums at Audiobook Builder’s website. Audiobook Builder stitches together many files to create (build), you guessed it, one long audiobook, which is great for books spread across multiple CDs. ABB happened to be the program I used to create my Pendulum M4B file, so it looked like a good place to start (though I’m not implying that Audiobook Builder was at fault; my Assault on Reason files were similarly deficient and those were stitched together with the Join Together AppleScript). The direction of that discussion leaned toward the mix of the file, specifically if it were mono, was the culprit. Sure enough my files had been encoded as mono. (Quick aside: Files encoded in mono aren’t any smaller than a stereo counterpart at the same bitrate. However, you can use a lower bitrate and maintain the quality of the sound with mono). Thinking I had the case solved, I converted the files to stereo, synced up the iPod and continued with the story. The thing quit again. Clearly the channels were not the issue. Without any further leads, I set about trying to eliminate variables. I tried a higher bitrate. I tried a lower bitrate. I removed the album art/book cover. I took all the chapter markers out. I removed all ID3 tags until all that was left was a bare bones AAC file. Then, just when it looked like that might work, it failed again. The last recourse was to segment the file into shorter pieces. Rather than one 24 hour file, I have ten 2-2.5 hour files. Yeah, that’s fewer than the nineteen files I started with, but it’s not as elegant as a single long one. But it works, so despite my frustration that the bug exists, I can finish my story without the constant scrubbing to a lost place mark. Another workaround I thought of is to use join the pieces into one long MP3 file. Then, after adding it to the iTunes Library, get info on it, marvel at the incredible length of the file, and select “Remember Playback Position” in the Options panel. That will emulate the bookmarking feature, but you won’t be able to play it slower of faster like a bona fide M4B Audiobook.